This recently modernized villa has been tastefully decorated. The villa benefits from a new kitchen, all new furnishings, new beds, sofas, outdoor furniture etc. The family room has a 50 inch TV, Blu Ray DVD player, IPod Dock (iPod not included) and an X-Box 360 kinect (with an assortment of games). All bedrooms benefit from en-suite shower or bathrooms. The villa has a large pool and a large upper terrace off the master bedroom. There is also an exterior barbecue area, undercover exterior dining area, sunbeds and exterior shaded seating area. This villa is very much our second home. We tend to visit at least three times a year and we love the time we spend there. Most of our guests have stayed at our villa on many occasions and our aim is to ensure you have a fantastic holiday. We bough the property so we had somewhere we could stay and we have refurbished the property to a high standard to ensure it's a wonderful place to spend time. As a family, we love the pool, the local restaurants and the proximity to the nature reserve and the beach. It's also great for those that like golf of just like to be pampered and enjoy the sunshine. Ground floor: bed 1 - en-suite bath/shower room with WC. Bed 2 - en-suite shower room with WC. Bed 3 - en-suite shower room with WC. Bed 4/family room - en-suite shower room with WC. Separate guest WC. 1st floor: Bed 5 - en-suite shower room with WC. 10 to 15 minute walk through the Ria Formosa nature reserve to the beach. Large room with marble floor, coffee table, sofas, small flat screen tv and large patio doors out to the garden and pool area. Recently installed fully fitted kitchen with cooker, hob, fridge freezer, wine / drinks cooler, washer dryer, microwave & breakfast bar (seats 2). There are many golf courses in the area with Vale do Lobo being only 10 minutes drive away. Notes on accommodation: The villa is arranged over 2 floors (ground floor & first floor). 3 bedrooms and the family room / 4th bedroom are on the ground floor and the master bedroom is on the 1st floor. The master bedroom on the 1st floor benefits from a large terraces, dressing area and en-suite shower room. There is a large private pool. Please note that there is no pool alarm or pool cover in place. Sorry no pets allowed and no smoking inside the villa. Outside: There is an exterior barbecue area, an 8 seater exterior dining table and chairs, an exterior sofa set with table and six sun loungers. There is also a large swimming pool with heating (the heating is charged at extra cost). The pool measures 11m x 6m with 0.75m at shallow end, 1.5m in the middle and 3m at the deepend. Utility Room: Property has a safe, travel cot & high chair, hair dryers and Wi Fi wireless internet access with no additional cost. Cleaning / Towels / Linen / Maid service: Maid service can be provide for £40 (or 50 euros) per visit. All linen is included in the price. Mid stay linen change can be provided for £15 (or 20 euros) per person. Other: The family room / bedroom 4 has a 50 inch TV, Blu Ray DVD player, IPod Dock (iPod not included), X-Box 360 kinect (with an assortment of games) & sofa bed. There are a large assortment of cable TV channels to choose from. We stayed at 47 Quinta das Salinas in September 2018. The villa was fabulous – decorated and furnished to a very high standard with lots of personal touches. The kitchen was very well equipped and the pizza oven was a bonus. We had great fun making and cooking pizzas one night. We really enjoyed the large pool and the heating actually worked. Internet connectivity was important to us and the wireless worked well. The area is lovely and quiet and although the beech is reachable on foot we definitely needed the car. Overall a great holiday and a lovely villa to stay in. Looking forward to going back! Our extended family (our young children and teenagers, our parents and ourselves) stayed in the villa for a month in August. Organisation of the holiday starting from reservation of the villa till the last day was as easy and hassle free as possible thanks to the lovely owners. They replied to all my messages straight away and made our stay extremely pleasant. Villa is spacious, tidy and light. Everything works. There are ACs in every room including the lounge (which is particularly helpful on the hot August days). There are a lot of toys, books, games and DVDs in the villa. Swimming pool is big, clean, deep at one side and shallow at another. The pool guy was available whenever we had any requests. Swimming pool is gated which is fantastic for the families with young children. There is plenty of very good equipment for the BBQ, Pizza oven etc. The area is very secluded and quiet, however it is very close to the various fantastic beaches, supermarkets etc. Our family would love to be back and would recommend this villa without hesitation! The villa was wonderful. Big pool with shallow end for kids. New modern bathrooms. All ensuite. Family room easily useable as another bedroom. About 7-10 mins drive from Quinta shopping and estate. The whole villa was contemporary, well equipped, clean and high spec. Would recommend. Fourth visit, better than ever! The Purdy/Payne tribe missed out on our annual trip to the villa last year as Dan was in the middle of a major refurbishment, so it was a delight for the 8 of us (six reasonably grown up grown ups, and two very grown up little ladies) to be able to renew our acquaintance with Quinta das Salinas. Dan's hard work has certainly made the place even more special, the bathrooms are now super deluxe and thanks to a change in local agent things seem to just be running that little bit better (pool cleaning and heating, gardening etc.). It is a wonderful spot, very tucked away and quiet even in high season - this was our first time in the summer, we usually go in May, but delightfully it was no busier than our earlier trips. Walking every morning out on the nature reserve (1 minute out of the front gate, turn right) and towards San Lourenzo is always a delight ,and Almancil is perfectly located for stocking up on supplies (and in Apolonia, you have the perfect antidote if you are feeling homesick for Waitrose...). the inflatables at the villa. There are some delightful restaurants locally, including Monica's which we highly recommend. We look forward to staying again next year. The villa was lovely, very clean & comfortable. We enjoyed our stay very much. The pool area was fab. There are lots of activities available locally such as horse-riding and tennis. There are many blue flag beaches accessible from Quinta Das Salinas, making it an ideal base to explore from. The nearest beach is Ançao beach, a lovely blue flag family friendly beach, which has a great beach side restaurant called “2 Passos”, serving good food with great service. Approximately 25 minutes drive from Faro Airport. 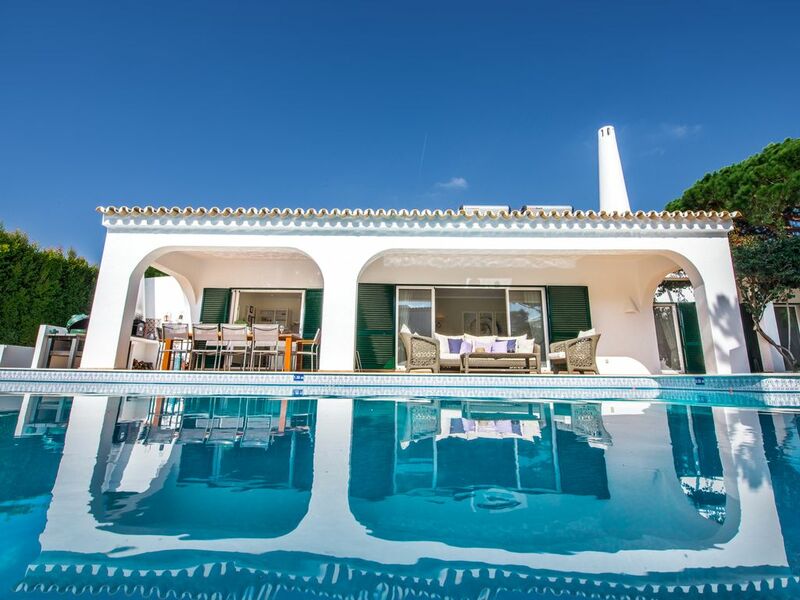 Approximately 10 minutes drive from Vale De Lobo and Quinta resorts. A rental car is recommended to get the most from your visit. Rental costs include the following per person: 2 flat sheets, 2 pillowcases, 2 hand towels, 2 bath towels. End-of-Stay cleaning included. Mid-stay linen change available for €20 per person (this will include changing all towels and bedding). Pool towels can be provided for 7 euros each per week. The pool can be heated for an extra supplement of £100.00 per week. Changeover Day: Changeover day is Saturday within season but flexible during the rest of the year. Arrival is after 4.00 pm and departure is 10.00am (unless otherwise agreed in writing with the owner). This is necessary to allow sufficient cleaning time between clients. Notes on prices: Rates are quoted in GBP. If, however, you wish to pay in Euros, the prevailing exchange rate as quoted on xe website will be used. All prices quoted include VAT.